I first published the blog below over two years ago. It immediately became the best read blog I had ever written. I realised there is a hunger for information and practical advice about the death process as it applies to pets, from a Tibetan Buddhist perspective. In a very direct way, this blog led me to write Buddhism for Pet Lovers. 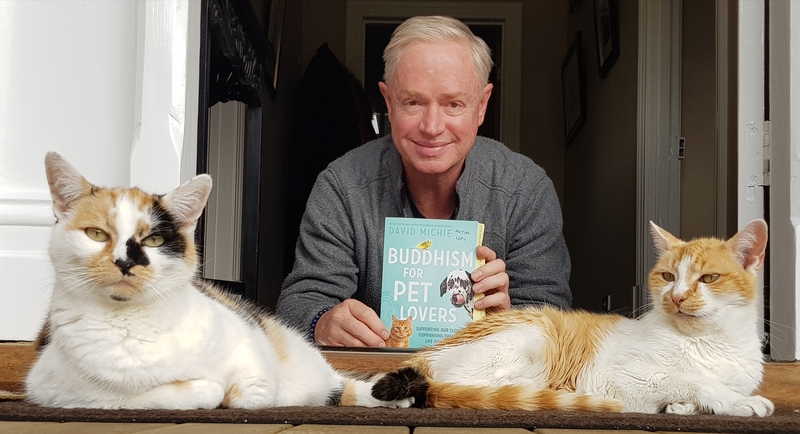 Buddhism for Pet Lovers is about a lot more than only the death process for pets – although I do cover this in detail, including vital issues like euthanasia, the bardo period and rebirth. Buddhism for Pet Lovers is very much focused on our life with pets – being mindfully present for them. Listening to them instead of only ever talking. Suggesting ways in which we can help them cultivate their own inner lives. I share not only Buddhist insights and some fascinating and recent scientific studies. I also include some pretty amazing stories shared by blog readers from around the world about their own experiences with pets. So … here is where it all started. This is not an excerpt from the book, but it does provide an overview of the death process. It is my heartfelt wish that you may find it useful. (Below: Photo-bombing my own little fur-babies, Kahlua and Narla, on the arrival of my first copy of the new book from the publisher). As animal lovers, the loss of our pet is something we dread. My wife and I have gone through this very recently, with the death of our much-loved cat, Mambo. Tibetan Buddhist insights and practices can do a lot, however, to transform the way we experience this event – and, far more importantly, how our pet experiences it. A major shift occurs when we view what is happening from the perspective of our pet’s spiritual journey, rather than from our own understandable wish to cling to our beloved friend forever. As animal lovers it is a joy, as well as our responsibility, to help our pets onto a happy mental trajectory in life. And, given the importance of death as a time of transition, one of the greatest blessings we can give them is a peaceful and positive death. When our pets are in good health, the best thing we can do for them is to help them avoid creating negative karma. It is difficult to give generic advice about how, for example, to curb a cat’s instinctive predatory behaviour except by making sure the cat is well fed, content and, if necessary, entertained. It is up to us to get to know our animal companions as well as we’re able and help however we can. If you have a leaning towards Buddhism, it’s also very useful to create a positive association in your pet’s mind between Buddhist images/statues/mantras and a state of well-being. 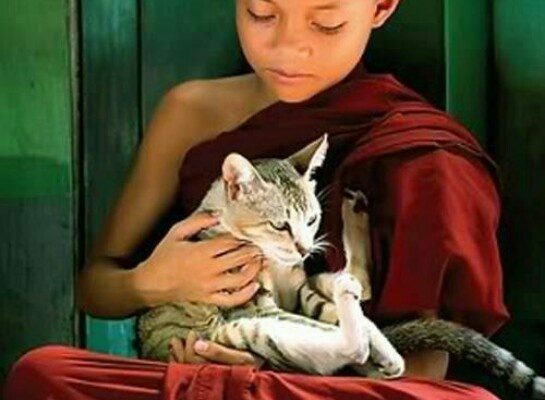 Murmuring mantras to your purring cat as you stroke her is an example of this – Om mani padme hum is one such mantra. Or if you are inclined to Tara practice – Om tare tuttare ture soha. If you meditate regularly, there’s a good chance that your pet will want to join you. Let them. There’s plenty of research showing that animals’ perceptive abilities are, in certain respects, far more sensitive than humans’. If they are able to associate the practice of meditation with a positive state of being, so much the better. From a Buddhist perspective, whether we are human or animal, we are constantly creating the causes for future effects, positive or negative. The more we are able to help our pet create imprints for a disposition towards enlightened actions, the better. When we are losing someone we love, whether human or animal, it is important to ‘get over ourselves’ and focus on the wellbeing of the one who is dying. If we really love them, we should be trying to put aside our own feelings of grief and loss and do all we can to help them have a painless, peaceful and even positive death experience. Pain management – This is a priority. Whatever palliative care we’re able to provide via the vet or otherwise, we should try to keep our pet out of as much physical discomfort as possible. No wailing – We may be heartbroken about losing our close companions, but it’s important not to upset them. Animals also know what is happening to them. Dogs break away from the pack. Cats go off to hide under the house. There is nothing positive from their perspective if the people on whom they are completely dependent start behaving unpredictably. It’s much better to focus on what’s best for our pet, not on our own feelings of attachment. I have heard animal communicators say that it’s important to communicate from your heart that, sad as you are, your friend is free to move on and you will be alright. This is not a Buddhist teaching, but it certainly supports the view that the needs of our dying companion should be uppermost at this difficult time. Peaceful and positive – If we are able to provide those last few cuddles, whisper those last few mantras, sit for those last meditations, this is what we can do to help give our pet a peaceful death. Provide positive imprints. Help prepare them in the best possible way for the inevitable. Euthanasia – In a short blog it’s not possible to debate all the considerations of euthanasia. I doubt that readers of this blog are among the group of people who would choose to euthanize a pet that can still enjoy a good quality of life. We don’t want our pet to suffer, but nor should we be in a hurry to short-cut the process. Dying is natural. It has its time and place. We need to give our pet time to come to terms with what is happening to him/her. Some Buddhists take the view that euthanasia may only postpone the suffering which a being has the karma to experience. My personal opinion is that we should only look to euthanasia when all other options have been exhausted, when there is only one outcome to which our friend is heading, when all our goodbyes have been said and when, if we were to change places, we would seek this for ourselves. The Buddhist view is that subtle consciousness can remain in a bardo or intermediary state, between death and rebirth, for a period lasting from moments until up to seven weeks. After the death of loved one, we are encouraged to continue focusing on the well-being of that loved one in the bardo state, rather than on our own sense of loss. You don’t need to be a therapist to see how attending to the well-being of others supports much greater equanimity than by focusing on our own bereavement. There are also a few very practical things we can do. 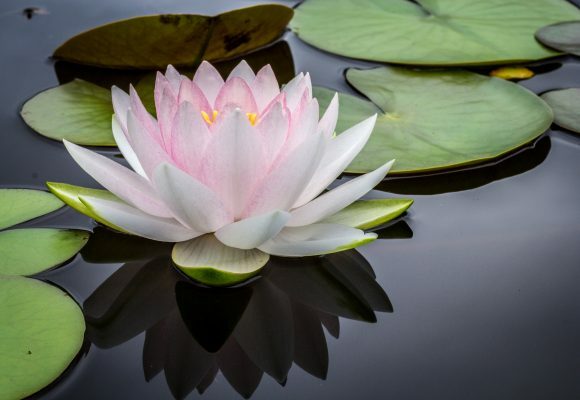 Make offerings – While it is not possible for karma or virtue to be removed or donated by a third party, it is possible to influence those with whom we have a strong karmic connection. Like our beloved pet. By making an offering of any kind, such as feeding birds, giving to charity, or donating blood, and self-consciously offering the merit of such actions to the benefit of our recently-deceased pet, our actions can have a positive impact on their experience of the bardo realms. For the benefit of all living beings without exception. We can continue to make offerings throughout the seven week period, in particular on every weekly anniversary of their death, when the greatest shifts in the bardo state occur. Dharma practice – For Buddhists, the greatest of offerings are not material, but Dharma practice. We can also dedicate our meditation, sadhanas or whatever spiritual practice we engage in, as a direct cause for our pet to enjoy positive conditions and ultimate enlightenment. Not forgetting – In the bardo realms, free of physical constraint, it is said that our subtle consciousness/energy is capable of moving anywhere very rapidly and perceiving anything – a form of clairvoyance. This includes the ability to return to where we lived. For this reason, for seven weeks after the death of a loved one, it is considered helpful to show that they are not forgotten. In the case of our cat, Mambo, we have left out his dry biscuits and water bowl, his favourite brush, and his litter tray. It is no inconvenience to us, and on the off-chance he should make a visit, he will see everything the way he was used to. After seven weeks, all bardo beings have moved onto their next experience of reality. From a practical point of view, this means we can clear away our pet’s things. From an emotional point of view, it brings to an end a natural period of mourning. Our pet has moved on, and so must we. Tibetan Buddhism gives us practical tools to help us manage the death of a loved one, whether human or animal. Much of the unhappiness surrounding death arises from our quite natural sense of loss. But we do have a choice. By focusing on our loved one’s consciousness as it moves from one realm of experience to the next, we are able to cope with the death of our pet with greater compassion and equanimity. 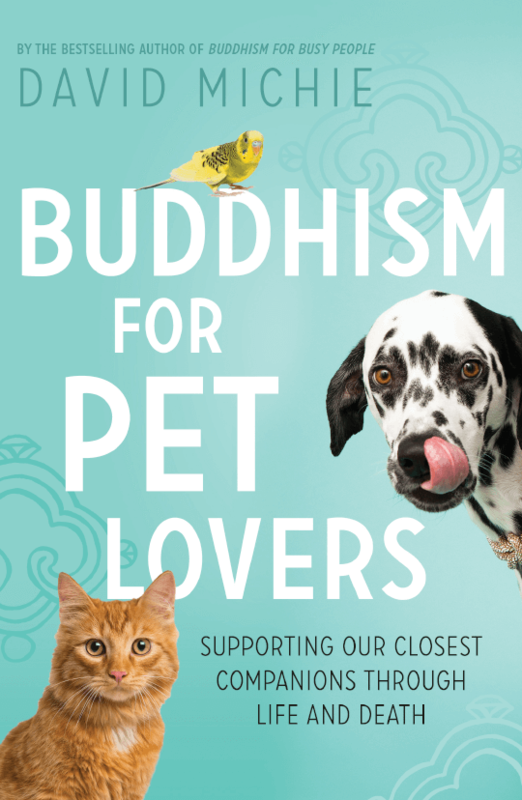 You’ll find a much more extensive explanation of this vital subject in Buddhism for Pet Lovers. David, I’m not even an animal-haver, but I just shared this on Facebook. It felt vital. I love your perspective. I wish i had seen this 3 weeks ago when my darling 18 cat, Charlotte, started let us know she was ready to leave after some dufficult days if trying to get her to eat, including various cat foods and fish she started getting highly stressed and agitated wandering around the house yowling very loudly. There was no appeasing her. Aa she had hyperthyroidism I took her to the vet for checks to see if meds needed increasing. He phoned 2 days later to say although slightly high but not as high when she had not been in this state but upped meds by half every other day. However, she rapidly declined and kept going aroumd the house howljng and then she squidged herself into a tiny space behind an open bathroom door. There she found some peace – later I moved her trying to get her to more comfortable position but she space one started howling and i could only sooth her by cuddling, stroking and speaking softly to her. I know cats hide in their dying process and we knew that sweet baby was ready to leave this world. As she lay still still, very still in my arms i just wanted her to go peacefully at home. But sadly i did cry because i knew it was time. Next day repeat of howling and wandering and not eating trying to hide. We took her back to the vet and he agreed her time had come. I said final goodbye and hugs there and my heart broke. We brought her ashes home and she now lives under a beautiful Japanese tree called ‘Madame Butterfly’. I have made small donations in honour of her and had online memorials dedicated to her. I grieve and beat myself up over the decision to PTS but I could not watch her suffer any longer the howling and constant wandering were heartbreaking and I could not help her. I pray I made the right decision but will never be comfortable with it. Charlotte ‘s bowls are on the windowsill as a reminder i guess ,now I know – for 7 weeks. This little lady had the gentlest soul ever, a normally very quiet little girl she just have off a strong very peaceful vibe. It has not left yet as the house does not have that ‘catless’ feel. I agree with you Kathleen. I wish I had seen this 6 months ago when I just knew something was not right with my beautiful Misty cat. He was with me for 25 wonderful years. I knew he was sick as he had hyperthyroid and kidney issues, and went blind on 3 months before his passing. I loved this animal so much and didn’t realise how much until he was gone. I realise now that I should have spent more time with him in his last months and not on trivial things or people who were really not important to me. He had been asking me for comfort and I put it off or didn’t recognise it. He was teaching me tough lessons. I am in such remorse now for not spending every living minute I could with him towards the end. His life was far more precious than anything else. Nevertheless he had a good life and we knew we loved each other. We were the perfect yin and yang combination and after all these years, we understood each other. I wish he could have spent the rest of his life with me. Over the 2nd week in January 2016, I had noticed he was sitting up instead of lying down. He must not have got any sleep. I asked him why he was sitting up like that, neglecting the fact that there was something wrong. He had also become very vocal, calling me around the house. Several times I did not answer. How much I wish I had just gone to him and comforted him. On 16/1/16 I was too busy doing my own timewasting and senseless things away from the house. When I came home, I knew things were not right. We went to the vet and they found a large tumour in his stomach. The poor little baby was still actively looking around and walking around. He was amazing. The vet had no bedside manner and against her will, I took him home for one more night to be together where we lay together all night. poor little thing, he didn’t sleep. He must have been so uncomfortable. I also couldn’t sleep and just tried to be next to him. I wanted him to know how much he was loved, and so he could say goodbye to me and his surroundings that had become so familiar, and his home. The morning of the 17/1/16 he lay in the sun at the back door, one of his favourite spots. He was telling me he had had enough. His face told me everything. I reassured him that I loved him and he had added so much to my life, that he was the most amazing beautiful thing I had ever had in my life. I thanked him for spending his life with me. I told him I was sorry he was going and didn’t know what I would do without him. He looked peaceful but I knew he was in pain. I said to him “you’ve had enough haven’t you boy”. His eyes were shut with that most recognisable look in his face that he was tired. We made the journey to the vet and thankfully I had a lovely lady vet who gave me time to say goodbye. She treated him with the same respect I would have. I felt dreadful seeing him sitting and trusting me while it all happened. Afterwards I broke down, naturally. I kissed him so many times, patted him, reassured him he will be ok and we will see each other again, and told him again and again that I loved him so much and I hoped we would see each other again some time. I know it is difficult and I have kept his things around the house as if he is still here. I have his ashes back and am putting him in his favourite spots during the day and he is with me at night. I hope his spirit visits me some time. Just a sign of him being here would let me know he is ok but I haven’t received the sign yet. Such a loss and I am sorry for your loss too. Our pets are our best friends. I feel totally lost without him. Thanks David. Very much appreciated. I’ve done as suggested, left all of his things where they were and I hope I can help him in his journey to his rebirth. Just wish he could be rebirthed with me! Not a sign of him yet but I hope he visits me some time. This has been a big lesson in consciousness, and my Misty has also taught me the most important lessons in life. Arn’t cat’s amazing. No teachers yet they seem to know. I wish I had realised a few things about being conscious, while he was still with me. Bless his little soul. I’ve just bought your new book and am looking forward to reading it. Have read your other ones about Rinponche. Sorry for your loss Kathleen. I agree with everything you have written and feel for your loss for the same unfortunate medical reasons that were so unfair.. Charlotte sounds like she was such a beautiful soul, just the same as my beautiful Misty of 25 years. I recently had to make the same decision, and have also been beating myself up for the same reason. If only we could turn back time and prepare them, – I didn’t know about the 7 weeks either until after. Leaving Charlotte’s things where they are is a good thing. you can still talk to her, and her ashes. I take the box of ashes to bed next to me, and continue the routine each day of what Misty did. It is hard, I know and something not a lot of people understand. I hope down the track you find some peace in your decision and I hope Charlotte is with you in a special way for the rest of your life. Bless you, your family, and Charlotte’s memory. Kathleen, I am with you. I experienced the same tough time with our 15 years old lady cat. She was wonderful. Has taken me 2 years to ACCEPT she is gone and to tell her last good-bye. Do not punish yourself. You have done your best. You have given her the best you could do. Thank you David (and Beth) for sharing this with me. I have been an Animal Communicator for over 20 years and yes, I agree with so much of what you said. I work with a lot of people whose animals are in the dying process and the Buddhist way is perfectly in sync with the animal way. I look forward to learning more from you and sharing the wisdom I learn from the animals with you. Hi David, I just lost my beloved Maya, my sweet little dog, just 5 days ago. She passed away at home of a heart attack. She was 12 years old. I was with her until I had to drive my daughter to school and my husband found her under our kitchen table, beside my chair. I took her to the vet’s in her bed and couldn’t bear to bring it back home. My husband put her dishes away because he knew I couldn’t. Can she still go through bardo without these reminders of home? I pray for her everyday. I just lost my beloved, 12-year-old cat, Isabelle, yesterday morning (2/22/2015). This article has helped me greatly, thank you!! New Year’s Eve my furry child (dog) left us and went to puppy heaven being only 6 year old german shepherd, my most loyal friend with uncondional love, our poor Kayla had a brain tumour and my health has gone down hill since that day, we miss her so much but we know and hear her spirit in the house, thanks for your most encouraging words, looking forward to more of your soothing words. This post is perfectly timed for me. We are currently helping our aging feline, Indy, of 14 years. Recently diagnosed with hyperthyroidism and early renal failure, I see after reading this post where to focus my energy. Of course I want her to be free of suffering and I had not considered her spiritual journey until reading this message. I am grateful for your good counsel. With love and gratiude, Jillian and Indy. Jillian and Indy – I so understand what you say – my 18 year old had hyperthyroidism – it seems itivery common in older cats, who like humans are living longer. It is sad to see them sick – I only wish I had seen this article 3 weeks ago, but I am still benefiting from it. Prayers and sympathy for you Indy. I lost my kitty, LeeLoo not even one week ago. I tried to do all that I knew to make her comfortable and I stroked her and talked to her as she died. I told her that I know that she will have a good rebirth. I am mourning and I know that I didn’t do everything perfectly but – I tried my best. Thank you for this blog. Thank you David for this insightful blog. I’m sorry for your loss of Mambo. I have experienced my past Bunny pet coming to visit me, and my new Bunny kid coming running in jealousy to take the place, so pets/animals are certainly sensitive to mind! Thank you so much David!! I read your allrecent posts and it really help me to improve my knowledge and wisdom. Thank you so much!! Thank you David! This was welcome and so enlightening! I look forward to reading more! WOW! Love this! Beautiful! Thnx David! we lost our cat suddenly this week, he was 12 and we think he had a heart attack. He was fine all morning. Laying up beside my husband like he usually does and then he came over and got up on the chair with me. He always put his feet against you and stretched and he did this and then laid down. I noticed him beginning to slide down further on the chair and proceeded to pull him back up and when I did this he was limp and his tongue was hanging out. My husband came over to chair and picked him up but he was gone. I still think I hear him sometimes at night and I do miss him. I found him and he was wild and had to hold him with gloves for he would bite and scratch. I took him to the vet and he weight 1lb 14oz and vet said he would be surprised if he lived, he was so small and he did and we enjoyed him for 12 yrs. Dear David, many thanks for this post and my deepest condolences to your family on the loss of Mambo. As a veterinary nurse of many years I have attended the transition from this life with many animals, including some of my own. I always chant the mantra silently in my head as the injection is given and whisper kind, soft words as the animal gently relaxes and leaves us. I don’t often cry (although sometimes it is a very emotional experience), I consider it a privilege to attend on such an important journey. It may be useful for your readers to know that many vets will go to your home to carry out the procedure which of course helps to reduce the stress on your pet, especially if they are not fond of the vet clinic. It may be worthwhile ringing around to find someone who will do that for you. Best wishes to you all. What a wonderful gift you are able to give the animals, Lesley. Thank you. I will check with vet. Also wanted you to know that I read the entire “Dalai Lama’s Cat” on the Sun Sounds of Arizona radio program, for blind and/or disabled persons. Thank you for writing these books, as they are delightful and at the same time share Buddhist teachings in a special, easy-to-digest fashion. They are so beautifully written and enjoyable. So sorry to hear about Mambo. Please accept my condolences. Question: How does a kittie actually die? Most of my other cats, I had put to sleep, with me holding them. I did that because I thought they were suffering. A couple of my cats died when I was not home. My present kittie, Lotus, is 15 to 16 yrs old, and is showing signs of age, but is still eating well and moving about well. When they actually pass on, is it peaceful and quiet, or do they suffer and try to fight it? Thank you for such an insightful post – we’ll be sharing far and wide. I am most grateful, thank you Pawesome Cats! I am so sorry for your loss, David. Our feline friends are very special companions, aren’t they? They have an aura. My gorgeous British shorthair, Chloe, died 7 weeks ago and I’ve buried her under the silver birch tree in my back garden. She was the most loving, gentle and affectionate animal that anyone could wish for. The bond between us was extraordinary. I am eternally grateful for having her in my life, but on the flipside, I am carrying a heavy heart. Thank you, David, for this insightful post. I’ve read a fair bit of literature on Buddhist practice/philosophy and death and dying, and your post is very helpful. Best wishes to you and your wife, and I am sure you will take comfort in remembering the special times you had with Mambo. In the last few months I have listened to your audio book “Meditations for Maniac Motorists”. I have to say that I have really enjoyed listening to this while driving. I’d like to share something with you, but first a little introduction. I’m an American living in Germany, and it’s not uncommon for people to drive long distances to get to work. It’s just a fact of life here… You may have heard that there are many speed demons on the autobahn here, and some like to get close while flashing the lights if you’re not fast enough. I have at times used mantra while driving, of course while paying attention to driving. For about and hour I repeat Om Mani Peme Hung, or Om Ah Hung Benza Guru Pema Siddhi Hung. By the time I’m done I have such compassion for other drivers. It feels great. Wow such a comforting read! I lost my cat Bear to squamous cell carcinoma just 2 months ago so I’m battling with her passing. She was only 10. Would like to get in touch with her through an animal communicator. We had a very special bond. Have a recording of her purring on tape and I sleep with some of her fur in a bag under my pillow plus made a beautiful garden feature around her grave as a tribute – just hope she knows! Thanks so much for this, glad I found it. David, I said goodbye to our beloved shepherd three weeks ago today. I have studied the bardo as much as i can being new to Buddhist beliefs. I have read and I believe as long as my prayers/blessings come from the heart, that is the most important thing. Bucky was fortunate to die here at home, with me by his side, surrounded with love. I want to devolve into my own sorrow and depression, but instead each day I perform my own version of a sur offering, I practice tonglen, I bless his treats with the medicine Buddha mantra, I chant Om Mani Pedmi Hun. I send him my blessings and my love, especially on the seventh day. I hope these rituals have helped him, but as you said, they have helped me too. I was so grateful for your blog in that it is impossible to find much information, if any, on how an animal might experience the bardo that may be different than a human perception. One Lama said that animals experience the bardo, but in their own animal way, but I could not find further exploration of that thought. It seems one would experience it differently given one’s cultural background, age, form, etc. Does a middle-aged man from Cleveland experience the dieties the same as a 92 Lama from Tibet? Or an infant, or a teenager or a blessed four-legged friend? I think any further insights or wisdom or teachings that you can pass on this area would be very helpful. A deeper understanding and respect for all beings can only bring more light to the world. Thank you! Thank you David for this blog. I lost my seal point Siamese cat, Oscar 2 days ago. He was 12 years old and had leukaemia and was very ill, but I know we did all we could for him and practising what is in your blog will certainly help him to the next realm. I am so grateful to have come across this blog as we are terribly heart sore and grieving losing him, but know that we need to create the right space for his feline siblings who remain with us. Oscar was very similar to the Dalai Lama’s cat in looks and even in his quirky traits and reading the books made me smile at this. Thank you for your wonderful blog David. I am sorry for your loss and have some empathy with you as I lost my beautiful little Pixie last Aug. I only wish I had been able to read this at the time as I was her as she died. Perhaps your beloved Mambo and Pixie have met up and are probably talking about us. My deepest thoughts are with you and your family. I wish I had seen this some years ago. Our rescue moggy developed renal failure and we had to eventually have him euthenised. However he did it on his terms. I had connected with this cat in a way I have only done once before. I knew once we had the diagnosis that it wasn’t his time yet, so we took him home “for a few days”. Mymother who lived with us asked what we were doing. I said he would tell us when he was ready to go, in the meantime we must keep him happy and comfortable. This inlcluded getting the neighbours to leave their side gate unlocked in the evenings so we could bring him in for the night. (he liked the trees in their yard as we hadn’t planted any yet). 3 weeks, yes weeks, later he woke with an eye infection. I told him I wasn’t letting him out today. He sat in an empty room for a few hours and then came to me, sat on the arm of my chair and “told” me it was time. Even my mum recognised what he was telling me. It was amazing. We took him to the vet that night. He curled up purring and handed over a paw and went peacefully to sleep. I would have loved to further improve his karma after that. He was a special stray that everyone who met loved. Thank you so much for sharing these helpful ideas to support an animal going through transition and also of your dear, Mambo. So much of what you say I have experienced when communicating with animals, including Morgan (rescue mongrel), who was the driving force for a book on this very subject, The Animal Communicator’s Guide Through Life, Loss and Love (also published by Hay House). I have read and love your books – The Dalai Lama’s Cat and The Art of Purring.Thank you so much for sharing. Thank you, David. Your words have arrived eight days after I made the decision to release my beloved Vida, who was only eight years old … Long story short, her bowel function had completely broken down, and after 13 months of trying everything short of surgery (not an option), it was time. It has been an agony for me to have been faced with the euthanasia decision … and my baby’s last day was filled with sunshine, love, cuddles, and a strange ‘fast-forwardness’ in our communications … She was so quiet and pliable in the moments leading to her death … and afterward, her body seemed (as my vet said) ‘two inches longer’ … So much tension and pain held for so long … Suddenly, with all tonus gone, her body reminded me of a cheetah’s — Two days after she died, two large white feathers (one about a third larger than the other) appeared on my living room floor. From where? I don’t know. Several friends of varying wisdom traditions told me that the feathers signal ‘All is well … the transition is complete.’ In a way, my Vida’s life feels like a perfectly closed circle … even as the sudden last-days decline and departure ravage my heart. She was such a cuddler — always in my lap, under the covers, on my chest, on my shoulder … I am so grateful for those feathers … and for your words. Thank you, and bless you and yours. I have studied Buddism and so this touched my heart. I recently had to say farewell to my beloved Munch who was dying from chronic kidney disease. I had done everything I could to keep him pain free. The treatment of having to drip him every day was traumatic to both of us but without it he would have collapsed. When I went away for work he refused to eat and fought my partner when it came to taking his meds and drip. Upon my return he looked terrible. I’d get him back to a point and then I’d have to leave again. My last trip before our farewell was just too much for him. When I returned I could see that it was all too much for him and I had to look at what I was doing – were all the meds for him or for me. I had told him many times that if he felt the need to go he should do so and that I released him but for some reason he chose to stay. The day I decided to euthanase him was heart-wrenching but I had to do it, I could not let him suffer any longer. Being in the animal welfare sector my focus is always on what is best for the animal and to keep human emotions and perceptions out of the equation but when it’s your own animal and due to the intense bonds between you and your pet it does tend to blur these lines. It is very difficult finding that balance without doubting your abilities or whether the decision was the correct one. Thank you for your insight. Hello and thank you for your great post. Our two dogs both died today one of them (mother) was only 2 years old and her puppy 3 months old. Both were killed by other people by poisoning them. I’m so sad and still crying. We are living in Thailand and our friend told that we are not allowed to touch the dogs for A day because the poison will get out off the dogs and them are ressu to get to “next level”.Both died dramatically, is there something good mantra I can use when we bury them? I will stop crying and will think positive thoughts about them. I am so very sorry to hear this, Sonja. I suggest you say the mantra ‘Om mani padme hum’ and visualise your dogs achieving precious human rebirth. I read this entry when you first posted, and was aware of your words when our beloved Patcho died on June 1. She was 20, but it was still unexpected, and I held her close as Daddy rushed home from work. We held her, spoke and sang to her, and I even managed not to weep too very much during the process – (unbelievably calm for me). When she became uncomfortable, we did choose to take her in to complete her journey. Tomorrow will be seven weeks. We have left many of her things out – her steps to get onto furniture, her special water dish, her litter pan step, her medicines… and have been putting her night light on each night that helped her see her way to her litter pan. I suspect that the “things” won’t be too difficult to put away or donate, but the nightlight and talking to her will be much harder to discontinue. I’m having trouble – knowing it’s time for me to let go. Just a bit of history: The first time I lost a kitty, whom I still consider my familiar, nearly 10 years ago, was very traumatic and left me with ptsd. I didn’t go through the grief stages properly, and it was well over a year before my mental health came back to reasonable. I eventually sought out alternative healers as western doctors and their medicines were not helping. In the first days after Patch left on her journey, she left pretty obvious signs of her presence. Those have now stopped. Her feline family, especially the two boys who slept beside her at night seem to still be grieving, but not as much. (But I know they also react to my energy). They rarely choose to sleep in that area now, and seldom do the two of them sleep next to each other. One other thing that is troublesome in this is that I carry fear every day because Patch’s dear companion, Mr F, has cardiomyopathy and heart failure. His condition has been stable – but that really means nothing. There aren’t always any outward signs that his condition is deteriorating. His death could happen without warning. His death could be peaceful or horrifying and painful. I rarely leave the house in case he needs me. I find myself in fear often, and then I know I have to exit to another place to put myself back together. Tomorrow will be difficult. I feel superstitious about it, in relation to Mr F’s condition. I do not know how I will handle the pain of losing two of my dear children. They are my family, my and my husband’s only children. Mr F will be leaving two of his birth children here when he must go, and they are very dependent on him, even after six years of becoming part of our household. One is extremely shy and only confident when he is with her. I fear not being able to help her. Lots of fear energy that I am trying to dissipate. It has been hot and humid, so my “analysis” that my boy is slowing down could be completely inaccurate. I can spend the day with him tomorrow. I need to stay present. Sometimes I verbally speak through what is present, because it is the only way my mind won’t race out of control. If you or anyone has any kind and helpful advice, please, I welcome the assistance. Thank you for responding and for your advice. My husband and I held a short time of remembrance this evening, with meaningful items placed around a special candle. I pulled up one of Patch’s footstools she used as a stair to her window. Before I could sit, Mr F walked in, hopped onto it and sat down. Attempting to keep my composure, I pulled up another stool and we spent some minutes in silence with the flickering candle inside the purple and green candeleria. Thank you once again for sharing this blog with all of us. I am still here, Mr F is still with us on this side. Patch gives a sign now and then, which makes me very happy. I am grateful that none of my paranoia was founded. On the last day of Patch’s 7 weeks, I slowly and consciously began to make changes in the house. It felt like more of a deep, sacred ceremony than merely putting some things away and straightening. My doctor has been, well, shocked trying to figure out how on Earth I am coping this well with Patcho’s death, and is concerned I am concealing something unhealthy. I explained some details from your post here, how I had read this before her death occurred, and about the 7-week bardo state. He seriously wanted details! (We all know that most Cognitive Behavioral therapy is not rooted in Western ideas! ☺) Having a time frame really did help me. Giving myself time to process things, and giving myself permission to leave things as they were for her. Welcoming her home any time. I’m continuing my journey of being present with my Mr F, who is beating the odds with his cardiomyopathy. Sometimes I still verbally narrate my actions to stay in the present moment, but it works. (And he doesn’t care ☺) I have read your book Enlightenment to Go, and am referring back to it regularly. At my last appointment, the doctor told me not to “humanize” the kitties – and I dislike when he says things like that. I told him I’d much rather “cat-ize” myself, I think many of us humans would fare better. He thought that an interesting idea, so I laughed and told him to look into that before my next appointment. When I reread your comment above, I laughed: “be more cat like in living in the moment”. I’m coming to re-read once again. Our sweet Mr F left us 17 days ago. My husband reminded me to be calm in the 5 minutes we had after he collapsed. I’m hurting, but I talk to him as if he were here, and I’ve kept all his things the way they were. I’m grateful he didn’t cry out in pain, I’m grateful I he shared part of his life with me. Now I must make good on my promises to him to care for his two young ones. What a special man he was, wise beyond his years. I’m trying to remain present through the tears and the longing. I’ve been so blessed. Thank you David, I found this particularly helpful during the death process of my beautiful dog, Bonnie. She died just yesterday. I would appreciate your advice, I am only in Zimbabwe, in my home, where my dog died, for three and a half more weeks. I would very much like to continue the practise of honouring her during the seven week process, but I won’t be here. What would you recommend for long distance? Dear David, would it be possible to use your post as it is here for our Facebook group called CDSI (canine diabetes support information) .this site has 3,500 members and growing daily. I believe the people who loose their fur babies on a daily basis would benefit from this post. It is a beautiful process you have and could help so many find some peace. Canine diabetes is a disease that changes the life of the person as well as the animal. Blood glucose has to be checked at least twice a day. Food is measured for caloric accuracy,and insulin injections are given twice daily. So David you can imagine how much time and love it takes to make this work. The loss of these animals is felt deeply. With your permission and blessings , may we use your post on the site? Dear Stacey, Of course – please feel free to use this material for the benefit of your group. Thank you for your words, advice and sharing the story of your dear Mambo. I was given the link for your blog by someone from an online pet loss support group as I prepare for the loss of mr sweet Manx, Gemma who has Feline Oral Cancer. I have been careful not to let her see or hear me cry since she and I share a strong bond. As I write this, she is snuggled up against me purring. I have told her how much we love her, thanked her being with us and told her it is all right to go, that we will be okay. I will continue this. What I realize now is to now with your blog is not to go to the ethunsia time ahead of time for the rid of the unpleasant part of it all. I believe I did this with another cat years ago. I also wanted to tell you that as I finished your blog and saw Mambo, I was moved to see him laying against the same Union Jack pillow that Gemma and I are laying against this evening. Thank you again. You gave me tools and solace at this sad time. Hi Anna, I am not aware of specific Buddhas relating to these realms, but given that all Buddhas’ minds penetrate all reality, animals and those experiencing other dimensions remain the focus of their love and compassion. How long does it take, according to Tibetan Buddhism, for the consciousness of an animal to leave its body or the vicinity of its body after death? My dog Charlie died last Wednesday. I was meditating beside him and reciting Pali Buddhist verses (refuges) beside him in the hours preceding his death. When he was breathing his last breaths (he died naturally, no euthanasia) I put my hand on his head and recited refuge to the Buddha (Buddham saranam gachami) and continued talking to him gently telling him to seek a higher rebirth and pratice the Dharma. I left his body there for two hours. Then I put it in a plastic container and preserved his body 48 hours with ice packs. We had him cremated 48 hours after his death. My concern is that the cremation 48 hours later may have disturbed his consciousness. Any thoughts? I am sure that Charlie’s consciousness would have left his body soon after physical death and that the cremation would not have been a problem. While it is possible for consciousness to remain in the body for more than 48 hours, this is only the case in the case of very experienced meditators. It sounds like you have him the best possible death a dog could have. I am sure you are continuing to carry our practices for his benefit while he is potentially in the bardot for up to 7 weeks after death. Thank you for this post. As a Buddhist practitioner i’ve read a bit about the bardo’s, but only now as one of my cats is suffering from diabetes am i starting to realize the consequence of his presence here. Sadly insulin isn’t working for him, so i decided to stop the treatment a few weeks ago. He has difficulty walking. I was contemplating what would be best for Pooh. After weeks of thinking about this subject and asking advice from fellow practitioners today i made the decision to let him live at home. I was considering euthanasia, but i never really felt comfortable with the idea. It’s hard to see my friend suffer, but i also realize that euthanasia would mostly be for my own comfort. He seems to be dealing with the situation just fine. I only wonder whether i’m not letting him suffer too much. As i mentioned, he can only walk a few paces before he needs to sit/lie down. And yet, when he lies down, he seems to be fine. I don’t want to make a hasty decision, but now that i’ve decided to let him stay in home, i really wish that he doesn’t suffer much. Thanks for this post, really good to read about this perspective and contemplate it myself. It creates room to include all beings and to see them as equal and to my friend as a cat and not as a human. I am a buddhist and My hubby and I lost our baby – Reese, German Sheppard after 11 years, due to stupidity of the Vet Clinic. I wanted to offer Merit to My beloved Reese, what’s the best way? I just found your website today. Our beloved dog Quincy died on Friday, Jan 1, from congestive heart failure. He died peacefully in our arms knowing we loved him. He declined so quickly, though, that we were unable to choose home euthanasia for him lest he suffer more. Instead, a compassionate and trusted veterinarian helped Quincy pass at the clinic where we rushed him after he went into severe respiratory distress. We miss Quincy so much. Now I wonder if you received messages from your dear Mambo after he died? If we do receive messages, would they only be during the 7-week bardo? Thanks for your comforting words. It helps to read them and those posted by others who have gone through such devastating losses. Thank you. My beloved Mr. Blue a 40 lb Poodle Beardie mix died last night at almost 19 years of age. He was so much part of my life, my heart – it was hard but I have been focusing on his passage into a new adventure. And I am just incredibly thank full I was able to love and know him for so long. Thank you for sharing your wisdom and this lovely article. I just put water in his bowl and a biscuit out. Thank you for this insightful post, David. I know it will reach those who can benefit from the wisdom, at the perfect time…myself included. My cat has chronic kidney disease, and though he is doing ok now, his time will come eventually. I am going to copy this to a file and re-read it often, so that when the time comes, I will be able to help my cat as much as possible. I have a “stray” young (3 or 4) spayed cat I took in to try and find a home for and in the last 2 years she has stayed in the pack porch. away from my other house cats because I was afraid of intreoducing her and fighting etc. I gave her love and attention and never did find a home for her. She developed terminal kidney desease and the vet strongly suggested “putting her down” sever weeks ago. I fed her twice daily, tried various foods (KD brands) and now she is not eating at all. I have never in my life felt so alone! I know she will be much better off and happy if I let her go but my selfishness has made her stay. I feel guilt and sorrow and, the best way to put it is to say I don’t want to be warm, I just don’t want to be cold. I know that may not make sense but I am empty and even though I know what I must do, I want someone else to make the decision. Any help or thourhts will appreciated. I have lost my family and my friends don’t seem to understand my pain. My thoughts are with you and the loss of your friend. Unconditional love is a wonderful thing and out pets give it naturally. What a blessing! Thank you so very much for your kind and soothing words. I appreciate it very much. However, the little girl is still with us. I did not follow the vets’ advice and asked if Scratch was in pain or distress. The vet said she believed that Scratch just didn’t feel very well but was not in pain at this point. So I have been feeding her (by coaxing) twice a day, allowed the faucet to drip into her water bowel, keeping her as hydrated as I can, and taking her into the garden for a half hour or so each day. She eats grass and has actually gained almost 1 pound. The vet said when she stops eating, starts throwing up, falling, etc. then it WILL be time. In the mean time, I have her love and companionship for which I am grateful and hope for all I can that I am doing the right thing. I believe that as long as she remains with us, it is that much less she will have to wait when she passes on. Also it is more time for me to get ready for that final horrible decision. Scratch is slowing down and loosing, very slowly, weight. I lay with her 4 times a day and coax her into into eating. There may be days or at the most weeks left and I believe she knows how I feel. My concern is that I realize when it is time and then be with her in all ways possible and allow her to pass with the peace she deserves. All of the comments and stories help and I am very grateful. 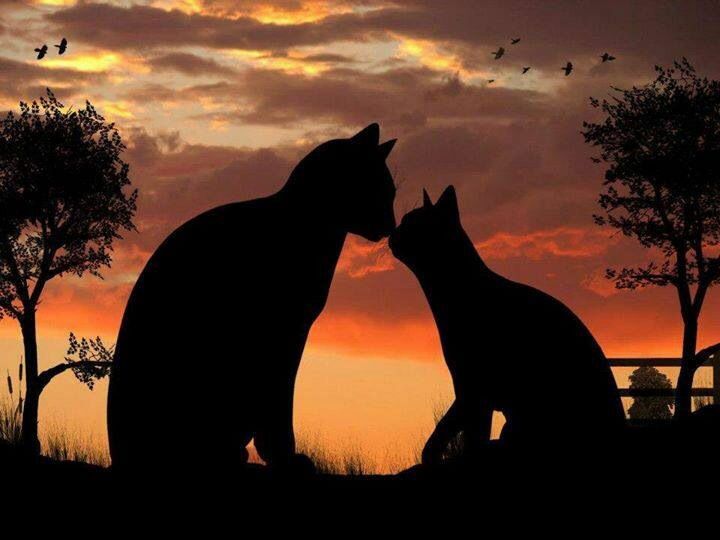 My heart goes out to the wonderful loving people who have lost their pets. I have lost so many over the years but somehow Scratch is hitting me harder. Thank you, Donna, for telling your story, and thank you, David, for your wise and compassionate reply. I had similar feelings after my 18 year old died of chronic kidney disease. It’s not unusual to feel we could have done more; my vet says she’s seen such feelings a lot, but that we need to remember we’d spent a very long time loving and taking care of our furry family members over their lifetimes with us and – being cats – they know we love them. My guy must have felt that right up to the time he stopped breathing, because even after 2 doses of sedative, he still didn’t let go fully until I told him it was okay to leave. He was a true bodhicattva and almost 2 years later I still miss him. I’m looking for peace – most importantly for my beloved 19 year old cat and buddy “Sport”. I know it’s time, and I don’t want him to suffer. I want him to depart this life with peace, love and comfort. Your words (as well as the others who have contributed their thoughts and experiences) have given me the strength and compassion to help my dear companion make his transition. My heart aches, but I know it’s the right thing to do. I will send this to my son who is a Buddhist and lives in Southern Thailand. i will ask him to go to the Temple to pray for Riley – my dog of 13+ years. In honor of Riley I went to the local quilt shop and made pet beds for rescue dogs for the local animal shelter. Riley was a rescue dog and we shared his life for 10+years… he was the sweetest sheltie who knew all of our moods. When he was almost crossing over he still sent us sweet love from his eyes. I am a practicing Theravada Buddhist. I just spent the last 3 days by my beloved Beagle of 17 years’ side. I spent this time holding her while doing loving kindness mediation, playing her recordings of the monks from my temple chanting and reading out loud to her from the Dhamaphada. However, I did not have access to pain medication and am feeling so guilty that I could not ease her physical distress through her long death process. Most of the time she was very peaceful and I retained calm and equanimity for her sake. At the moment of her transition I can only pray she felt peace as I sat watching her take her final breaths and chanting refuge in the Triple Gem she seemed to experience distress. Thank you for your blog and advice. Also, we are going to take her to be cremated. Any special advice? Thank you and may you be well, happy and peaceful. David, can you please explain what you mean by the “greatest shifts in the bardo state”? You wrote, “We can continue to make offerings throughout the seven week period, in particular on every weekly anniversary of their death, when the greatest shifts in the bardo state occur.” I have been making weekly donations in memory/honor of Indy since her passing – as you suggested. Can you please help me understand how this is supportive for her or what this can do? I’m not familiar with the ‘shifts in the bardo state’. Thank you for your assistance. Jillian. My dog has been there for me in some of the darkest times. It pains me to see her life slowly going away. She is almost 17 years old and time is trying to take her. You’re right about making the time about your pet, and to make it a happy peaceful death. I could use as much advice as I can get, thank you. David, my dog, Michie, passed a few days ago – July 2, 2016. She was always by my side, followed me from room to room and when I left the house she would look for me. I received a couple signs from her, one of them led me to you (you share the same name), I like to think that was a sign. My heart aches that she may be looking and waiting for me to come get her and that is why she sent the sign. When Michie transitioned did her fear of abandonment leave? Thank you David. Kindest regards, Jill. Thank you so much, David, this has been a source of much needed guidance for me in the 2 weeks since losing my beautiful cat Rrose. it also affirmed my instincts to not change anything in the first moments after her passing. Every day I move her “pouf” over to the sliding doors where she would lay in the sun and watch the day go by, and every night I continue to move it over next to the bed so she can come up and visit in the night if she desires. I am trying to make offerings, and today, the 2nd week “anniversary” of her passing, I will be donating all of her meds back to our vet, to be used for the shelter cat organization they do work for, and for sick cats whose parents can’t afford meds outright. These things make me feel that I can still give her love and care and attend to her well being while she is transitioning, which has given me such relief from the helplessness I have been feeling otherwise. My darling Trixie is a 15 0r 16 year old Maltese, Pomeranian mix. I rescued her 11 years ago. For quite awhile I felt it was a mistake because she was a physiological mess. We grew together like two people who came from different backgrounds. She has become the best little dog ever. I love her dearly. She was diagnosed with stage 4 kidney disease. I take her for fluids everyday but she is slowly weakening. I tell my friends, she is my everything and I can’t bear to let her go in any capacity unless she makes the decision herself. I do believe animals have control over their deaths as people do. She is my first dog so the sadness is very intense for me and she’s still here! Can you please help me make the transition to be there for her during this time, and afterwards. At the moment, I’m caught between denial and great sadness. This is not helping Trixie! I am sorry for the delayed response – I was on meditation retreat. Thank you for your reply and incredible understanding! It’s been 2 weeks since my first post to you. Just today- I felt Trixie looked so bad and I called the vet to perform euthanasia at 8pm. At 7pm- trixie was drinking and looking alert! I called the vet who was getting ready to drive over! He was amazing- saying if I felt tonight was not feeling right – and that a couple more days would help us both – then it was fine with him. He wanted to be sure I wasn’t delusional – by asking if my usual vet had seen her recently. I told him – yes- so he felt satisfied . It maybe very near- but I’m so, so glad I listened to my instincts. I had to put my darling girl to rest on July 28, 2016, so avoid any more suffering. I am beyond sad- sad doesn’t even begin to explain my feelings. IT feels to me as if I haven’t seen her in years! It’s very strange to me. Two days later- I heard ( so I thought) knocking or shoving my back door open- I went to open it and there was no one there, it wasn’t windy, nothing was hitting the door. So, I just opened it and said, ” Come in Trixie”. It just felt right. My other dog, is now having an problem- I can barely keep my mind/life together with my other dog not doing well. Could you please shed some hope and light. My dog died on 08 July. She would have been 4 on 01 August. She was hit by a car and I am devastated as it was my fault. I caused her death through my negligence and now I can’t forgive myself. She didn’t die immediately – her eyes were sort of glazed and I don’t know if she was conscious. I had my hand on her side and I think I said her name but after about 2 minutes she became still. She was a truly amazing dog. I sometimes thought she was Lassie come back, the dog I had when I was 10 (I’m now 66). I had a very sad childhood and Lassie kept me going. She always looked at me so intently when I spoke to her and it was like talking to a person. We meditated together often and as soon as I said “shall we have a meditate” she would jump up on the sofa beside me. She had 5 puppies a year ago and many people said they were the healthiest puppies they had ever seen. I believe the meditation through her pregnancy helped. I did not plan to keep any of the puppies but one came back after 2 days and I kept him. I thank God he came back to me – he has helped me come through this. My greatest fault is that I cannot forgive – myself or others. It’s almost as if this has happened to give me the opportunity to learn my hardest lesson. How can I let go of this and move on? She was so loving and full of joy and I have deprived her of so much. Dear Bridget, Your action was obviously not intentional, and she will have understood that. She would not wish you to live with this self-recrimination. There is still time for you to dedicate positive actions to her wellbeing while she is in the bardo state – as I describe in my blog. Please also see my most recent blog on letting go of past hurts. Thank you David. I am feeling a lot better and looking after my other dog Indy has helped enormously. I have also been doing positive things in memory of Myrtle. It’s comforting to think I might be helping her transition. My dear 1-year -old baby dog past away today. I got him when I was living in Thailand and tried almost a year get him home to Europe. There’s lot of restrictions when taking a pet to another country. He was staying with my friend during the process to get home him almost 7 months. Finally we got him home to my parents last Wednesday and got to meet him last weekend. He was full of joy when meeting me again. I thought everything will finally fine and I can stop worrying for my baby. Today my parents got him to vet and he got very angry and aggressive, he bite and tried to attack and was dangerous. The vet told to my mother that they need to put him sleep. My mother had to take this difficult decision and is claiming herself right now that she made wrong. I feel terrible for her. I’m living in different country and got this sad news today. I feel devastated..This can’t be happening. Yesterday I was holding him and now his in Heaven..
Is there something I can do to make sure he will be in good hands next life or that he will have everything ok. Even though I can’t visit his grave right now I would love do some rituals for him? I would love to say goodbye somehow. I couldn’t say goodbye, I couldn’t take the decision. I would have gone through different options to train him…but now it’s too late. Can I do something even thought euthanasia is already done? I feel so bad. Dear Sonja, Try not to feel bad. You did the best you could with what you knew at the time. 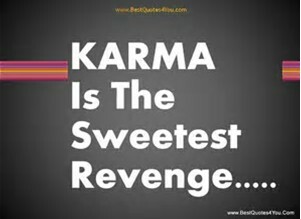 You still have a karmic bond to your loved one. You can still practice generosity, recite mantras and dedicate the merit of your positive actions for your animal companion’s wellbeing. This will be of benefit both to you and to your friend. I found this information very helpful…especially the “get over yourself” part. My DIXIE dog age 10 has oral cancer…sudden onset and cannot be surgically resected. She is on palliative care now….will require euthanasia transition soon…maybe next week. Thank you for your blog which I found last night after having to put down my beloved 19 year old cat, Berri. Although I practice another form of Buddhism, I couldn’t find any advice about the death of a pet. Your blog was so helpful and encouraging and it was great to find that I sent her off with love and compassion & prayed for her rebirth into a new wonderful existence just as you suggested. Thank you, David. I came across your blog when my cat Oscar passed in April last year after contracting feline leukaemia and intestinal cancer. It really helped me and I have no doubt Oscar too. Sadly, I lost another cat 2 weeks ago, Ziggy to the same awful feline leukaemia. This time I was more prepared having acquired the knowledge of your blog. I knew from the time that he arrived in my life that he had leukaemia, but he was fit and healthy. He would have been 5 years old in September. He took ill on the Saturday afternoon, I took him to the vet that evening, he had a blood transfusion as his red cell count was very low, which sadly did not help. The disease had spread to his lymph nodes and was then terminal and by Sunday he was so weak and his organs started to shut down and he passed early hours of the Monday morning. I had time to speak and meditate with him and am sure this all helped his passing over. I am so grateful that I could be with him on the Sunday and in the early hours of the Monday morning to talk with him and tell him that it was fine and I would be okay. Ironically, this all happened while you were in my beautiful country, SA and I was following your wonderful blogs on your time in Kruger. I have been at home for a few weeks recovering from surgery and he was my constant companion and shadow during this time. I am so grateful that I got that time to spend with him, little knowing it was our last few weeks together. Although I am terribly saddened by his departure, I take comfort in knowing I did all I could for him and I know he knew that too. Thank you for this blog, you have given so many people guidance and the tools to assist us when our beloved pets pass over. I wrote to you earlier about my dog Myrtle who died on 08 July. I have recently been on holiday in Spain. There was a dog staying at the hotel but he hadn’t taken any notice of me. One day I was lying on the sunlounger by the pool and he came over to me. He made a fuss of me and then jumped up on the lounger and lay beside me. It occurred to me that it was exactly 7 weeks since Myrtle had died. I thought she had probably sent him to me to comfort me. It made me cry. The dog stared into my eyes and licked me. Eventually he went back to his owners. He hasn’t been near me since. I now truly believe Myrtle had come herself on her final day to say goodbye. When I adopted him, it was clear that he was neglected, starved and probably abused and it took a long time to earn his trust, and even though he would never trust any human completely, he trusted me more than anyone. I suspect he gave up his life to open my life to the needs of the two cats who now live with me. I have no way of explaining how I know this, but had I not adopted these two cats when I did, their lives would have been horrendous. So, at times when I’m with either of my cats, I give a nod of respect to Alex and thank him for his sacrifice. Thank you for your wise words. Although I’m not Buddhist, I appreciated the insights you shared. I’ve said goodbye to several pet companions over my lifetime, and the pain has always been deep. Most of the time, I worry about my own failings in ways I did not or could not have done more for them. I’ve sent prayers to them and for them on the other side to ensure them that I love them and wish them well. It was comforting to know that there is, in Buddhism, a similar practice that values this. As an acupuncturist who has been treating animals (and humans) since 1978, I am moved and delighted to read your blog. I lost my pet, Nina, 8 year old Boxer suddenly, just like that. It has been just a week and yesterday I saw this blog. I am so grateful to you having written this post. I left the prayer at her tiny tomb along with biscuits and her favourite sweets. She filled all our lives with warmth, a tonne of happiness and I feel so happy to have shared life with her. I feel in her leaving she has spread to all living beings around me. I feel her even in the sunshine. I don’t know how else to speak of this period. Even though she was plucked out of my heart in the most casual fierce way… in leaving her tiny body she was expanded herself to all life around me. I am touched by the prayer you have written.. I say that for her. It is fascinating how similar the “process” is as we go through the pain of losing a relative or a family member. Well, if we think about it, our pets eventually becomes family. I have lost both immediate human family members and dog family members, and the depth of my grief has been the same. 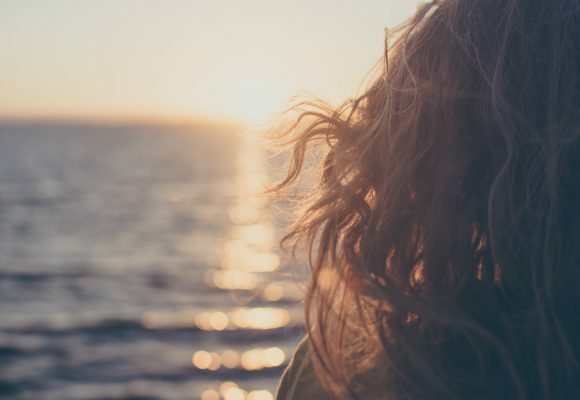 Debilitating, crippling, heartbreaking…But the memories of joy of having these loved ones in my life ultimately brings me peace and comfort, and I am filled with gratitude for having them in my life, both physically and spiritually. Can you give me any information on any Buddhist prayers/chants that I could do for my dog who was euthanized in November 2016. I fear my constant crying might have interfered with his transition and would like to repair any damage I may have caused. I tried to add a comment yesterday, but I don’t see it here posted today. I did keep my dogs water bowl, beds, toys for the 46 days of the Bardo, but I could not stop crying. Can you give me any suggestions? What a synchronicity to come across your blog just 2 weeks after my beautiful and only 3 years old cat Titi passed. Titi was the short name for Nefertiti, as I knew her name from the very first time I saw her huge green eyes and gorgeous angular face. She was never a lapcat, on the contrary she was very shy and anti-social. There were times though when Titi had a look in her eye that seemed to peer into the chamber of my heart and by return she allowed me to see her vulnerability and craving for connection. Those moments were priceless and the bond that Titi and I have is beyond words. We fought cancer for 6 weeks with chemo and blood transfusion but it didn’t work. Now I’m starring at what’s left of my sweet Titi, a tiny bag of ashes which I’ve surrounded with flowers, candles and her favourite treats. What’s best to do with her ashes to ensure rebirth and a much better outcome in her new life? Shall I scatter them over water or keep them with me? Thank you so much for this very insightful post and the beautiful prayer, it sums up everything that I could wish for my beloved Titi. Dear Ana, Thank you so much for your kind message. What a beautiful image of Titi you evoke. Kiera is 17, but only came into my life a few years ago. She lost her hearing about a year and a half ago, and more recently has lost her vision as well. She is dying now, and I am providing palliative hospice care to the best of my ability. As long as she doesn’t seem to be in pain or distressed, I am committed to avoiding euthanasia for her. I tell her repeatedly that she is free to go when she is ready. We meditate. I chant and sing with her on my chest so she can feel the vibrations. Can you advise any further actions to ease her transition? She has ceased eating, so it won’t be too long now. Dear David, thank you very much for sharing this teaching, it’s very useful and comforting. Abu, my beloved cat, passed away five weeks ago so I’m dedicating him the Dharma practice on the next two weeks. Best wishes to you, Rita. I am so glad that you’ve found this helpful, Rita! Warm wishes to you and may Abu enjoy high rebirth and quickly attain enlightenment for the benefit of all beings without exception! Thank you so much, my very old, beautiful cat Nivea is passing away from cancer and I have been beside myself until I read this article. She’s the first pet I’m going to lose this way, and you were unbelievably helpful to me. what can i do , there are many animals that i have met & know who have died , are dying & going to die especially horses who are traumatised been work police & metro horses . we are in cape town . for many years i visit the horses daily then they leave for retirement or moved location am no longer allowed. then i hear something terrible just happened & 1 just died. we have no bona fide animal saint locally at all .plus as well i hear than some police horses actually get taken to the lion cheetah park & get shot there then their meat is fed to the cats. are there any rinpoches or holiness who have ongoing free prayers for pets & requests??? ?especially horses as well . or is there a good patron saint of horses website online prayer requests? it is very difficult for dying animals & horses in cape town & surrounds. i am a tib buddhist meditator alone. My sweet dog passed just yesterday and I found your message very helpful. I’m relatively new to Buddhism and am still learning. Where can I read/learn more about Dharma practice?